About 6 years ago, I acquired the loft bedroom at my parents' house. The walls were a very bland whitish-beige. I hated it. I grew up in the beautiful Napa Valley, which is always so full of color. Every year, I loved seeing the mustard fields in full bloom. I thought it would be a great idea to bring the beauty of the mustard fields home to my bedroom. 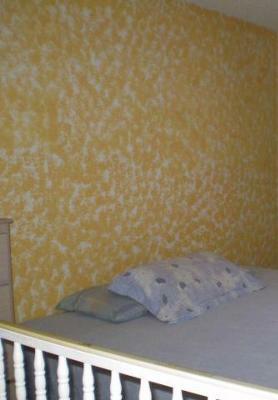 I begged and begged my parents to let me repaint the wall at the head of my bed and make it an accent wall. After much reluctance, they finally agreed. So, I headed down to the hardware store, and bought some mustard yellow paint, some eggshell white base paint, and some sponges. I first painted all 3 walls (remember, this was a loft, so no 4th wall) eggshell white. After that dried, I taped a piece of plastic on the adjoining wall to where I would be sponging, to protect it from the yellow paint. Then, I started in on the sponging. I dipped the sponge in the yellow paint, squeezed it out over the paint pan, so that the sponge was wet, but not dripping. Then I dabbed the sponge on the wall, occasionally rotating it to vary the design a bit. I continued to do so until the wall was covered just the way I wanted. I then used a small paint brush to get in the corners. With the paint brush, I just made little dots in clusters, and that looked like the sponging. It blended in very well. Word of advice for anyone looking at sponge painting a wall, or a room: please don't do it on impulse. 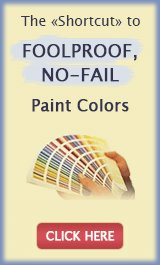 Give the color and design some time in your head before you rush out and buy the paint. My wall turned out fine, though looking back now, I can see that it could have been a huge disaster. Make sure that the colors are what you want to keep around for a while. 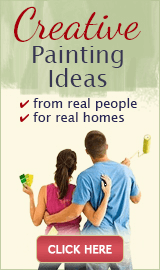 I would suggest going with lighter colors- blues, greens, or maybe even pinks.